ISIS bomb, U.S. consulate, Irbil: At least three killed, none U.S. personnel. 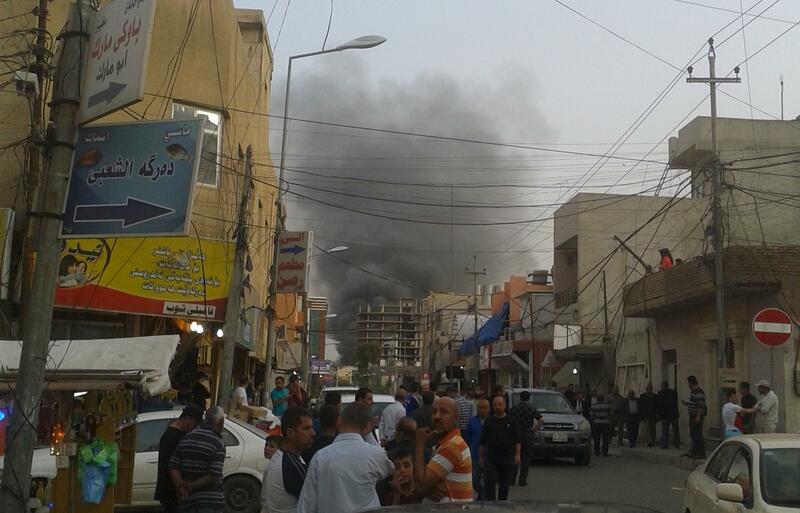 Smoke rises from the site of Friday’s bomb attack in Irbil. ISIS has claimed responsibility for a suicide bombing outside the United States consulate in the Kurdish city of Irbil, Iraq, that reportedly killed at least three people Friday. None of the reported casualties are United States personnel, a State Department official says. 2/2 All Chief of Mission personnel accounted for & no reports of injuries to these personnel or local guards. Closely monitoring situation. It’s the first attack on a U.S. facility since ISIS’s attacks in Iraq began. Irbil is the capital of the semiautonomous Kurdish government and is “considered so safe that the United States moved many of its diplomats here from Baghdad when the Islamic State captured Mosul and threatened Baghdad last year,” according to McClatchy. The American facility houses diplomats and a military command center.